In 1987 the Montreal Protocol, an international environmental agreement, established requirements that began the worldwide phase-out of ozone-depleting CFCs (chlorofluorocarbons). In 1992 the Montreal Protocol was amended to establish a schedule for the phaseout of HCFCs (hydrochlorofluorocarbons). The Montreal Protocol is codified in U.S. law through Title VI of the Clean Air Act. The Clean Air Act is the law that defines EPA's authority and responsibilities for protecting and improving the nation's air quality and the stratospheric ozone layer. 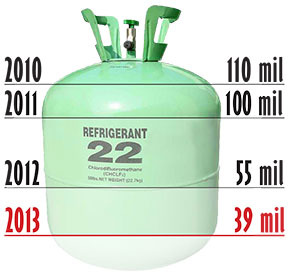 R-22 (Freon) is the refrigerant in 90% of the commercial air conditioning systems in use today and has been for decades. The EPA strictly controls the production and importation of R-22. The alternative approved refrigerant is 410A, but due to the higher pressures needed to be effective, cannot be used in R-22 systems. 410A systems have only been available for commercial-grade HVAC systems for a couple of years and thus the bulk of the building stock in Sacramento uses R-22. Due to the rapid increase in price, contractors & suppliers are beginning to hoard R-22 supplies and thus creating shortages, limited availability, and steadily increasing prices. Beyond the increasing price, which is manageable, the growing problem is the uncertainty about the availability of R-22. If the availability of R-22 is in jeopardy then it will affect all businesses, industry, IT, and commercial real estate that want to repair or recharge their AC systems. If conditioned air is critical to running the business and R-22 is not available then an alternative refrigerant will be needed, or the entire system will need to be changed to use 410A. Not all alternative refrigerants are compatible or deliver the needed performance and cooling capacity and the lead times to replace entire systems can be from 1 week to 2 months, either solution would be unacceptable during the hot summer days. EPA’s production restrictions on R-22 manufacturing are accelerating due to an EPA determination that there is an oversupply of R-22. These production restrictions will make R-22 more and more difficult to acquire and increasingly more expensive. Jan 8, 2013: A recent EPA notification announced additional limits on the importation and production of the R-22 refrigerant to only 39 million pounds resulting in price spikes and severe rationing of the supply. As an example, COAC was recently buying R-22 by the pallet (40 jugs per pallet) and now we are limited to 2 jugs per order. Additionally, in the last 6 months the price of R-22 locally has spiked 240%. In some parts of the country, the rate is double that increase. If your building's HVAC equipment uses R-22 , now is the time to plan for the eventual phase out of that equipment. Please contact COAC with your questions or concerns about changing your equipment. Contact us at 916.381.4611. Jan 20, 2012: The EPA announced an immediate, 45% reduction in both production and imports of R22. This constitutes an additional (-35,000,000 lb) reduction, in the level already legislated by the Clean Air Act. As a result, all the major manufactures have announced significant price increases, and are currently limiting shipments. The potential for allocation based on historic purchase level has also been discussed. Although R22 production will continue thru 12-31-2019, it is likely that this action will have a dramatic effect on both the price and supply of R22 moving forward.